Which cheese do you use for risottos and pasta? Traditional Parmesan cheese is not vegetarian as it is made using calf rennet. For vegetarians there are other hard cheeses available, often described as “Parmesan-style” cheese. They are just as tasty, but made with vegetarian rennet. 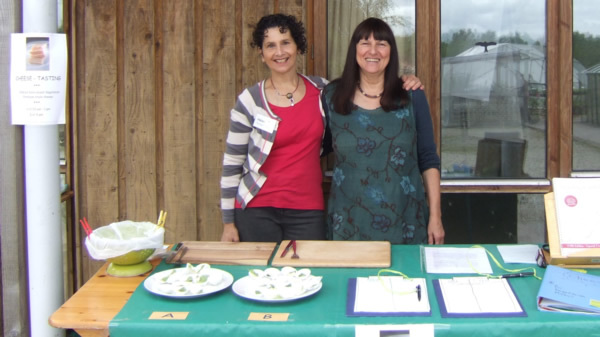 We noticed that many chefs are not aware that true Parmesan cheese can never be vegetarian (the name “Parmesan” is protected), so to raise awareness we had a “Grand Tasting” of two excellent alternative cheeses, on the occasion of The Organic Centre Garden Party in Rossinver, Co Leitrim in July. There were lots of visitors, all very interested in the cheeses. We asked them to tick their favourite and also asked for feedback. We tried just two brands, A) Twineham Grange from Bookham & Harrison in West Sussex, England, which we have been buying on line at www.bookhamharrison.co.uk and B) Gran Moravia (made in the Czech Republic for an Italian Company called Brazzale) which is available in Dunnes Stores nationwide. Both cheeses are “Vegetarian Society Approved” in the UK. And the result of our Grand Two-Cheese Tasting Test was… that BOTH of the cheeses went down well! Twineham Grange earned 52 Ticks of Approval and Gran Moravia had 36. Both cheeses are fantastic grated or shaved, as an ingredient in a creamy risotto or over a fresh salad, omelette or pasta dish. Many people commented that they actually preferred these cheeses to “normal” Parmesan. They loved the layers of taste and the tanginess which follows on. However, it wasn’t a surprise to us that many visitors were not aware of the source of animal rennet. If you would like to send a letter about the Parmesan issue, please download our PDF letter here, sign it and sent it!